City Attorney Rejects LJCPA “Proposed Appeal Procedures”. LJCPA Try’s Again. The City of San Diego has directed the La Jolla Community Planning Association (LJCPA) to incorporate their appeal procedures into its city approved bylaws. In response, the LJCPA established an Ad-Hoc Committee (Committee) on Bylaw Revisions and held publicly noticed meetings to draft their appeal procedures. On March 3, 2011 and March 1, 2012 the LJCPA adopted the Committee’s recomendation and submitted their draft appeal procedures to the City for approval. Upon review by the City, the City Attorney rejected the LJCPA’s proposed appeal procedures as drafted. Below are the initially drafted LJCPA proposed appeal procedures highlited in yellow followed in red with the City Attorney comments. (1) The LJCPA recommends that a project be denied and the City approves the project. (2) The LJCPA determines that findings cannot be made and the City disagrees. When a project has significantly changed after review by the LJCPA, such that the project heard by the City is materially different than the project heard by the LJCPA, then, if and the City approves the project, the LJCPA President has the authority to determine if may determine this is to be an adverse decision. Regarding the deletion above; CP 600-24 already provides that this circumstance is one that allows the CPGs to hear the item again. (34) An environmental document is certified by the City that the LJCPA believes determines should not have been certified. Some terms other than “determines” should be used; the CPGs are not tasked with making “determinations” on environmental documents. (1)(A) The following provisions pertain to a potential aAppeal of any the City of San Diego’s (City) adverse decision . when the La Jolla Community Planning Association (LJCPA) has recommended to the City that the project be either ‘denied’ and/or ‘the required Findings for the requested permit cannot be made’, or other adverse decision. City already identified in the document, and “adverse decision” was already identified. (2) (1) When an applicant initially contacts the LJCPA regarding review of his/her project by the LJCPA, the President or the appropriate Review Committee Chairperson shall notify the applicant of the LJCPA’s Policy to aAppeal adverse decisions by of the City. of San Diego to ‘approve’ a requested permit when the LJCPA has previously forwarded a recommendation to ‘DENY’ the project or made another adverse decision. The notification should emphasize the LJCPA’s ability to ‘aAppeal’ the City’s decision, including to APPROVE to the highest levels of City government in accordance with the provisions of the San Diego Municipal Code (SDMC). The purpose of such notification is to persuade the applicant to consider the concerns of the LJCPA in an effort to fully comply with all applicable provisions of the SDMC, the La Jolla Community Plan, Land Use Plan and Local Coastal Program and all other applicable rules and regulations. (3) (2) Should the Trustees vote to recommend to DENY a requested permit(s), and/or the ‘required findings cannot be made for the requested permit(s),’ the President will offer the project applicant the option to revise and re-submit the project design drawings for further consideration by the LJCPA. (3) permit(s) and/or the ‘required findings cannot be made for the requested permit(s)’, the President shall inform the applicant that any decision by the City to ‘approve’ the requested permit(s) is subject to potential Appeal filed by the LJCPA. 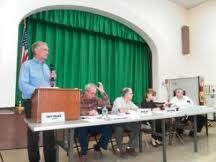 The President shall request that a hearing or staff decision by the City on the requested permit(s) occur not more than 10 days norless than 4 days before a regularly scheduled monthly meeting of the LJCPA, so that should the City decide to aApprove the requested permit(s), the LJCPA will have an opportunity to consider and vote on whether or not to aAppeal of the City’s decision within the City’s 10 day appeal period. The President shall inform the applicant and the City that when the LJCPA has recommended to DENIAL ofY a requested permit(s), that any decision by the City to ‘Approve’ such permit(s) made more than 10 days, or less than 4 days before a regularly scheduled monthly meeting of the LJCPA requiresthat the President is required to file an appeal. Wasn’t the notification already done in #2? (5) (4) When an majority vote of the Trustees has recommended to DENY a requested permit(s) and/or the ‘required findings for the requested permit(s) could not be made’, and contrary to that recommendation the decision by the City is to the ‘Approve’ the requested permit(s) orr made another adverse decision is made, the Trustees shall consider whether or not to aAppeal the City’s adverse decision to approve the permit(s) to the next higher body at the next LJCPA meeting. With an affirmative vote by a majority of the Trustees present at a publicly noticed LJCPA meeting, the LJCPA President shall aAppeal that decision to the next higher decision makinggovernmental body. (6) (5) When a majority vote of the Trustees has recommended to DENY a requested permit(s) and/or the ‘required findings for the requested permit(s) could not be made’, and contrary to that recommendation the decision by the City is to the ‘Approve’ the requested permit(s) or made another adverse decision AND the appeal period ends before the next regularly scheduled meeting of the LJCPA, the President shall file a timely appeal. in conformance to City of San Diego Information Bulletin 505. An appeal filed in such a manner is not required to be brought to the trustees for confirmation unless requested by a Trustee or the Applicant. When does request need to be made and when would confirmation need to occur in relation to the appeal hearing? When the LJCPA has voted to take exception to an Environmental Determination made by the City, and with an affirmative vote of a majority of the Trustees present at a publicly noticed LJCPA meeting, and after all other project appeal rights have been exhausted , the LJCPA President shall aAppeal the Environmental Determination by the City to the next higher governmental body. (A) An appeal filed by the LJCPA shall be defended by the LJCPA at the appeal hearing. It is the duty of the President to represent the LJCPA at the appeal hearing as outlined in Article VII, Section 2. The President may work with other Trustee(s) as part of an organized presentation. This Article, Section doesn’t’ address this. (B) At any appeal hearing, the LJCPA President or appointed Trustee shall state that he or she is representing the LJCPA and shall advocate for the LJCPA’s recommendation(s) and/or finding(s). Only the President or the appointed Trustee may appear as the official representative of the LJCPA, although other Trustees are encouraged to attend appeal hearings in their personal capacities. What citizens do in their personal capacity is not an appropriate topic for the bylaws. Section 9. Questions Not Specifically Answered. If a question or issue regarding Appeal Procedures arises that is not specifically addressed herein, the LJCPA Trustees should decide the question or issue in accordance with the spirit of these writtenAppeal Procedures . No, the bylaws need to provide the procedures by which the CPGs operate. See CP 600-24, Policy, pg. 2.